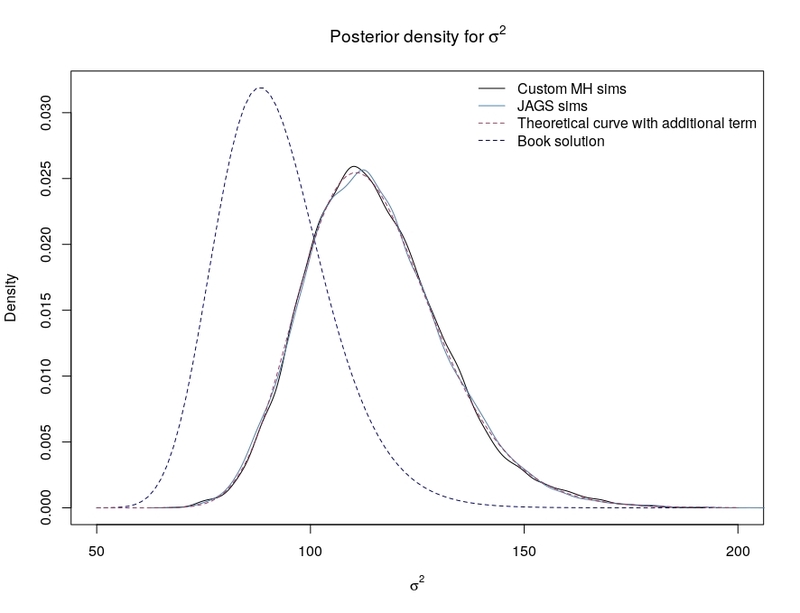 A chance occurrence on X validated: a question on an incomprehensible formula for Bayesian model choice: which, most unfortunately!, appeared in Bayesian Essentials with R! Eeech! It looks like one line in our LATEX file got erased and the likelihood part in the denominator altogether vanished. Apologies to all readers confused by this nonsensical formula! The solution manual to our Bayesian Essentials with R has just been arXived. If I link this completion with the publication date of the book itself, it sure took an unreasonable time to come out and sadly with no obvious reason or even less justification for the delay… Given the large overlap with the solution manual of the previous edition, Bayesian Core, this version should have been completed much much earlier but, paradoxically if in-line with the lengthy completion of the book istelf, this previous manual is one of the causes for the delay, as we thought the overlap allowed for self-study readers to check some of the exercises. Prodded by Hannah Bracken from Springer-Verlag, and unable to hire an assistant towards this task, I eventually decided to spend the few days required to clean up this solution manual, with the unintentional help from my sorry excuse for an Internet provider who accidentally cutting my home connection for a whole week so far…! 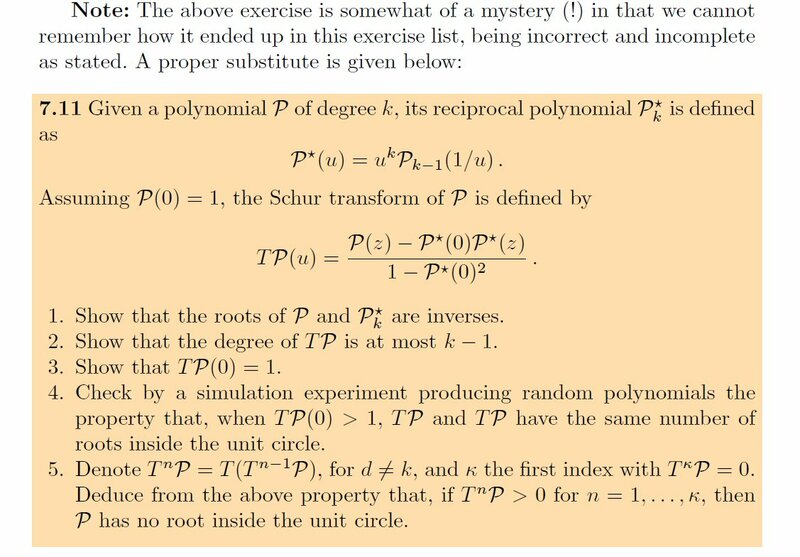 In the course of writing solutions, I stumbled upon one inexplicably worded exercise about the Lemer-Schur algorithm for testing stationarity, exercise that I had to rewrite from scratch. Apologies to any reader of Bayesian Essentials with R getting stuck on that exercise!!! Bayesian Essentials with R is now available both as an e-book and as a hardcover book on amazon.com!